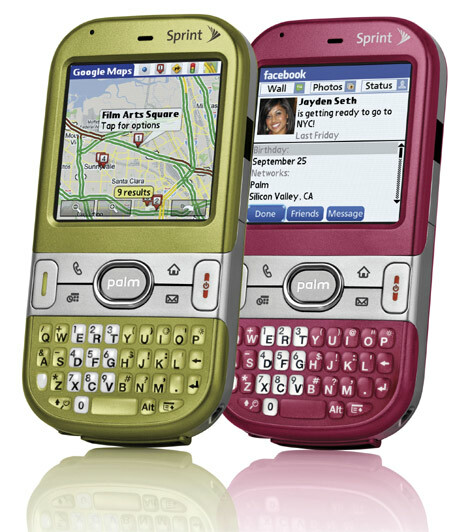 Following the success of its Centro smartphone and in preparation for the holidays, Palm today announced that the Centro smartphone for Sprint will become available in two new soft-touch colors – Olive green and Vibrant rose – as early as Oct. 19 at select retail locations, and beginning Nov. 2 in Sprint Stores, consumer and business sales channels, and online for as low as $79.99. More importantly, Palm also announced that it has DOUBLED the available memory on these Sprint Centro smartphones to 128MB (up from 64MB on existing models) and naturally also still leaving the ability to add up to 8GB more with a microSD card. Additionally, these new Sprint Centro smartphones will now have the new excellent Facebook for Palm application (screenshots above) and Google Maps with the My Location feature pre-installed on the device. 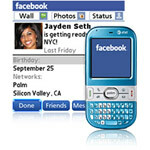 Facebook for Palm lets users connect with friends, respond to messages, upload photos and videos, receive status updates, browse friends' profiles and send out new friend requests -- all right from their Centro. And with Google Maps' new My Location feature, Centro knows where the user is and what's close by, so customers can find nearby restaurants, get directions, or see updated traffic reports. Although I’m not a fashionista, Leatrice Eiseman, executive director of the Pantone Color Institute added: "We're seeing fashion designers gravitate toward olive and rose tones, as forecasted in the PANTONE Fashion Color Reports for Fall 2008 and Spring 2009. Olive green and Vibrant rose are both strong fashion colors, offering a sense of sophistication and elegance. These hues are classic colors, with the longevity to translate from season to season." The new colors will be available for a special promotional price -- as low as $79.99 with a two-year subscriber agreement and $100 mail-in rebate and $25 or higher data add-on or Everything plan with data -- through Jan. 10, 2009. -- Centro Side Case -- This smart and elegant leather side case has white stitching, smooth microfiber lining to help protect the phone, a magnetic closure and an attached belt clip. -- Centro Leather Flip Case -- The new Centro leather flip case lets users access Centro's touch screen, keyboard and buttons while it's snapped safely inside the case. It flips open for talking and using the phone, and comes with an array of liner and stitching colors to choose from -- black, green, rose or blue..
-- Vehicle Power Adapter -- The new vehicle power adapter for Centro is small and sleek, and includes a USB-to-microUSB cable and a multi-connector adapter (microUSB to multi-connector). SPECIAL OFFER: To celebrate this latest Palm announcement, for a limited time get 10% Off your purchase of any accessories in our Centro Store. Just enter coupon code CENTRO10 during Checkout. That's a lot of internal storage for a Palm OS type device, while still maintaining a reasonable price point. Too bad the Centro doesn't have the WiFi or GPS ability built in. Why Cant Palm come out with a black centro with the soft touch finish. I would buy it in a heartbeat. why not a palm centro w/ 128mb or more, that looks like a treo pro, and with wifi and gps, too? 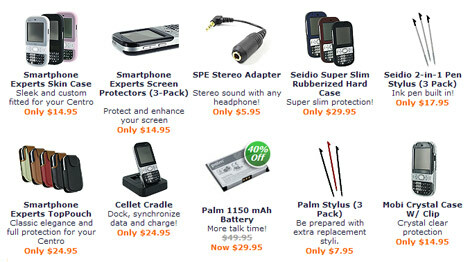 "why not a palm centro w/ 128mb or more, that looks like a treo pro, and with wifi and gps, too? For the moment, yes. 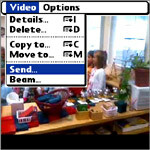 Next year, once Palm is ready to unveil Nova, they can do something like what you're describing. What they'll choose to do, of course, is still TBA.